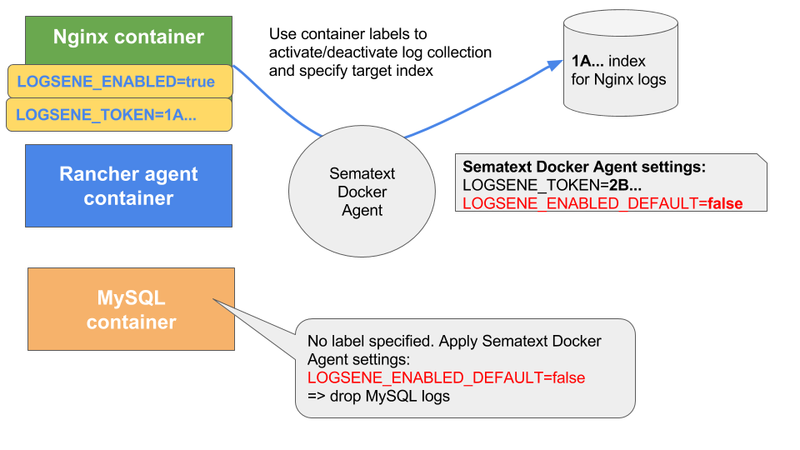 Sematext Docker Agent is a modern, open-source, Docker-native monitoring and log collection agent. It runs as a tiny container on each Docker host and provides automatic collection and processing of Docker Metrics, Events and Logs for all cluster nodes and all auto-discovered containers. It works with Kubernetes, Mesos, Docker Swarm, Docker Datacenter, Docker Cloud, as well as Amazon EC2, RancherOS, and CoreOS. Gives each team in an organization full control over log collection for their containers and the routing to their Logsene Apps or Elasticsearch indices. As you can imagine, this is very handy for larger organisations where e.g. one Swarm or Kubernetes cluster is shared by several teams, and each team needs to enable/disable log collection however they see fit and ship logs to different destinations. Lets one exclude collection of logs from infrastructure containers whose logs may not contain enough value to be worth collecting. We can also inverse the setup and enable log collection for all containers by default, as illustrated in the following figure. 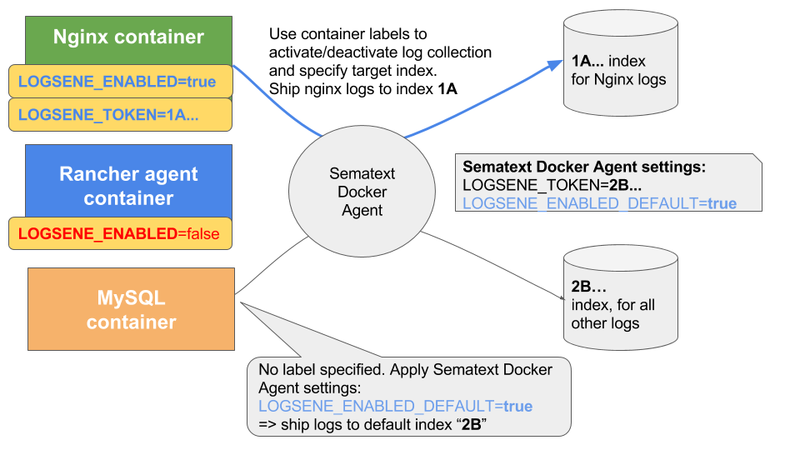 Sematext Docker Agent log routing via container labels (default settings) – collect and ship all logs, either to default Logsene app or to container specific apps. We’ve also introduced TAGGING_LABELS. This flag lets you enrich your container logs with data extracted from your existing Docker environment variables or labels. Just specify patterns for values to extract, e.g. TAGGING_LABELS=”com.docker.,com.myorg.,role*”. This will add extracted values to your log events as additional fields (you can also think of this as meta-data) and let you easily slice and dice your logs by using values from labels or environment variables. You can, of course, also build custom reports using this data, thus extracting more value and operational insight from your existing data in Sematext Cloud. Need a tool that collects your containers Metrics + Events + Logs? Try Sematext Docker Agent, it’s all open-source and can send your data to Sematext Cloud so you don’t have to manage or build out the backend for storing all the monitoring data, alerting, etc. For feature requests, bugs, or PRs, see sematext/sematext-agent-docker.